Food for thought: French farmers take their grievances – and their tractors – to the streets of Paris. Europe’s farmers grow angry over the political decisions driving them towards financial ruin. Irish farmer John Ryan is angry. The Ukraine crisis has become a live issue for European farmers, he claims. The Russia-EU sanctions war has led to an over-supply of food and depressed prices. Meanwhile, the proposed integration of Ukraine with the EU could present new competition. “Farmers don’t want Ukraine in the EU,” says Mr Ryan. “In the first place, they have too much cheap wheat… the EU meddling there destroyed the agricultural sector because they had no foresight. “If the euro drops any more and interest rates rise, the whole sector will crash,” he warns. In recent months, producers’ frustrations have spilled over. 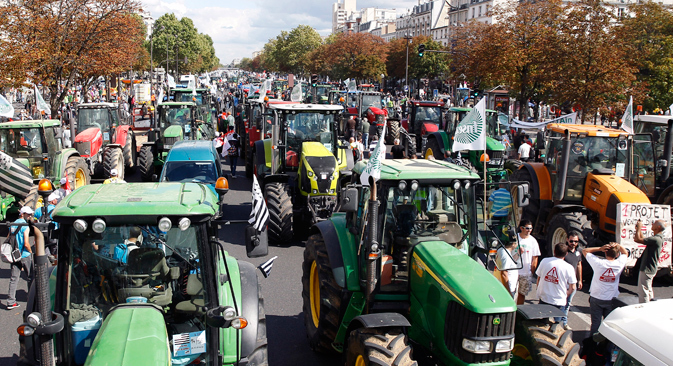 On Sept. 3, thousands of farmers, accompanied by 1,500 tractors, blocked the major arteries into Paris. They were protesting against rising taxes and increasingly strict environmental standards, which, allied to plummeting food prices, have destroyed farm incomes. took to the streets of Paris in September as French farmers staged a huge protest against falling agricultural prices. Hell hath no fury like angry French farmers. Thus, after the disruption, President François Hollande caved in, promising help. It’s not only in France. Over the Spanish border, in Santiago De Compostela, a similar demonstration erupted a week later. In between, Irish farmers pulled milk off supermarket shelves to express their anger at price drops. Inspired by the reaction in Paris, hundreds of farmers descended on Brussels – from as far away as Finland – a few days later, demanding EU intervention. Soon, €500 million was found for “support measures” for agronomists. However, Albert Jan Maat of Copa-Cogeca, the umbrella organisation for EU farmers and agri-co-operatives, remains unhappy. “EU producers have lost their main export market to Russia, worth €5.5 billion annually, and a €500 million aid package will not be enough to compensate for this,” he says. The reason for their anger is simple. Food prices, especially milk, but also meat and vegetables, have collapsed this year. The cause of the crisis is also clear: the sanctions war between Russia and the West. the amount found by Brussels to support EU agriculture. Milk production has seen the most serious price collapse. After events in Ukraine in 2014, Europe and the US first attempted to punish Russia with punitive travel bans and asset freezes. Amid heightened tension in eastern Ukraine, those measures were extended to embargoes on Russian banks’ access to international markets. In conjunction with weak resource prices, the policy worked. Russia is hurting; its economy is in deep recession. Brussels’ lawmakers probably didn’t countenance blowback as they united, together with their US allies, in opposition to Russia’s interference in Ukraine. When Russia struck back with its own counter-sanctions on EU agricultural goods, many analysts initially reacted with bemusement. However, the Kremlin’s move has proved remarkably effective. In late August, EU agriculture commissioner Phil Hogan admitted that European farmers are paying the price for the EU’s foreign policy. “The only sector taking the hit arising from the foreign policy and decision by Russia has been agriculture,” he told the press. He added that it was a “very difficult situation” because Russia was “the recipient of 10 percent of the world’s dairy products”, and “Europe was their first port of call”. It goes much deeper than that for Europe. In 2013, before the geopolitical tussle, a third of EU fresh fruit and vegetable exports went to Russia and a quarter of exported EU beef. Around 75 percent of EU cabbage, 63 percent of tomatoes and 52 percent of all EU apples sold abroad went to the alliance’s giant eastern neighbour. EU-Russian trade grew from €90 billion in 2003 to €325 billion in 2013. As a result, many European companies became heavily reliant on Russia. This increased in the crisis years earlier this decade, when Russia partially compensated for decreased intra-European demand. Last year, however, the value of EU agricultural goods sold in Russia fell by 24 percent, from €11.8 billion to €9.1 billion. Preliminary figures for 2015 predict an even greater drop. While Russia is discovering new import markets – 60 percent of all Brazilian meat exports now go there – the Kremlin’s measures have led to an oversupply of food in Europe. This has inevitably caused a breakdown in prices. For instance, farm-gate milk prices in the UK fell 25 percent to €0.31 per litre in the year to June. As the Ukraine crisis seems to be fizzling out, there are now signs of an EU U-turn. The French agriculture minister, Stéphane Le Foll, visited Moscow this month and pleaded with his counterpart, Alexander Tkachev, to repeal the counter-sanctions. The Kremlin demurred, indicating such a move would be contingent on the EU first cancelling restrictions on Russia. The following day, European Commission chief Jean-Claude Juncker unexpectedly announced: “We (Europe) can’t allow our relationship with Russia to be dictated by Washington.” This was an apparent strike against American insistence that Europe toes the line on sanctions. Mr Junker added that the West must “treat Russia properly” and address it as an equal. Meanwhile, Mr Ryan has an ominous warning for Eurocrats. He worries that, if the Brussels-Moscow impasse is not resolved, “there will be queues for food in Europe redolent of the USSR’s final days. The EU farmers are producing and selling goods for below the cost of production and the banks and the governments can’t subsidise this. So out of business they will have to go. Unless they back off over Ukraine and tell the US to get lost,” he says.